Welcome to the web home of the Mammoth Beat Organ – a modular, mechanical music contraption by Sam Underwood and Graham Dunning. 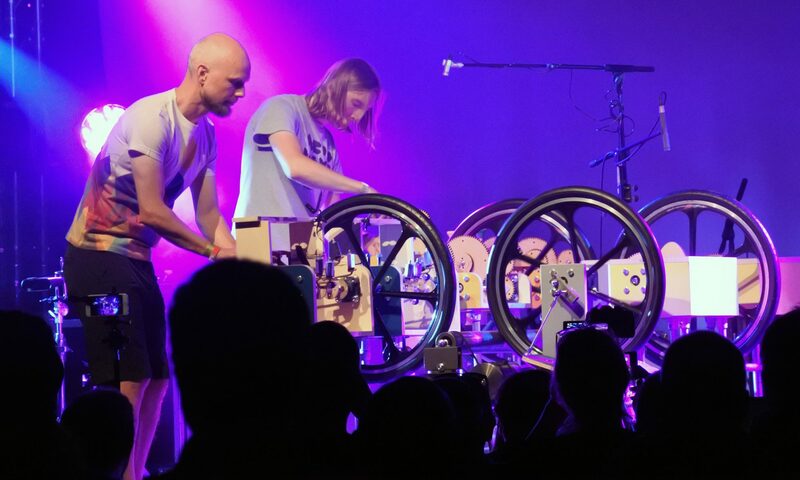 Designed as a two-player, semi-autonomous musical instrument, it plays unusual, sometimes erratic compositions drawing on drone music, minimalist repetition and fairground organ techniques. Behold the Mammoth Beat Organ…in action! Please subscribe to our YouTube channel for all the latest Mammoth Beat Organ videos. The Mammoth Beat Organ is a mechanical, modular music contraption by Sam Underwood and Graham Dunning. We have designed and developed this machine together over the past five months, following initial discussions in 2017. We will be looking to tour with it in 2019. This project has been funded by Arts Council England, with further support from Lintstock, Supersonic Festival and Horniman Museum.